Eskil has a reputation for honesty and integrity in its management practices and in all commercial transactions. For the company, including each subsidiary, and for every one of us, it is vital to preserve this reputation and promote the continuation of the trusted relationships that exist with all the individuals and companies with whom we have business. In various degrees we are all the guardians of the reputation of Eskil. Consequently, the company expects integrity in the conduct of every one of us. This policy comprises a set of rules adopted by the Eskil Board of Directors which applies throughout the Eskil Group to all directors, officers and employees. These rules set the standards for the way we interact with society at large and the environment around us. Through globalisation and a range of social, ethical and environmental issues involved in the conduct of international business, Eskil faces numerous challenges and opportunities in meeting and exceeding our corporate social responsibilities. The purpose of our CSR Policy is to ensure Eskil, its subsidiaries, affiliates, and associated companies consistently operate in a manner that minimises detrimental impacts to society and the environment. As employees of Eskil we are all identified not only by Eskil’s brands but by the way we interact with society at large and the environment around us. Our continual aspirations to achieve and surpass the highest standards of conduct and CSR are essential components of how we measure our success. Through our Eskil CSR Policy, standards of social behaviour have been established that to meet and exceed minimum legal standards. 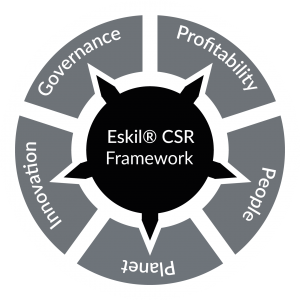 Eskil continues to develop, implement and manage a wide range of CSR programmes covering a broad spectrum of complex issues. We also participate in multiple philanthropic activities, support educational initiatives and promote environmental best practices in our day to day operations. Eskil is a unified team trusted to consistently deliver high-value services. We consistently seek to contribute to our customers’ ability to flourish in changing global and local landscapes. Eskil and its subsidiaries, affiliates, and associated companies is committed to the establishment and maintenance of best practice environmental, safety, and occupational health programmes. We support programmes designed to protect the environment and health of our employees, our customers, and local communities. Eskil recognises that operational, economic, environmental, public, and social concerns are all integrally linked to Eskil’s future mission. Meeting the commitment to protect these concerns is a primary senior management objective—as well as the individual and collective responsibility of all Eskil employees worldwide. In order to achieve this, we refer to our core values of CATIE: Collaborative – act professionally, respectfully and collaboratively as we inspire our clients, people and partners; cultivating open and honest ongoing relationships; Accountable – trusted to honour our business and social commitments. We take ownership of issues in support of our clients; Trusted – belief that reliability, flexibility, honesty & integrity are the foundations of all of our relationships. We provide professional and confidential guidance to our clients; Innovation – always be willing to constructively challenge the status quo and act with speed and agility to drive global growth; Ethical – take pride in our business and work ethics. Through our CSR programs we support local communities, ecological initiatives and actively promote equality and diversity. Eskil seeks to be a good corporate citizen in everything that it does.